All felines have a natural urge to sharpen up their claws from time to time. But if you leave them to their own devices, it is likely to be your furniture which ends up getting clawed to shreds! Instead, you are better off buying them a cat scratching post to help them keep their claws in check. Before settling on one, it is worth knowing more about what different options you have – and we are going to help you out in this task with our comprehensive guide of the very best cat scratching posts available. 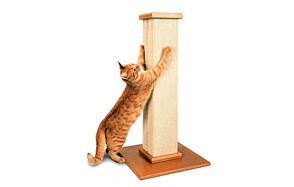 Coming in at number one on our list, we have this scratching post which describes itself as the ultimate option. There is no doubt that it is highly durable and made to withstand numerous scratching sessions. Also, it is bulky enough to allow your cat to stretch out to their fullest – both horizontally and vertically. When you get the post, it is easy to assemble. And once you have set it up, it is designed to stay in place thanks to the sturdy base which stops it from tipping over. The woven sisal material encourages your cat to scratch there, thus decreasing their urge to tear up your other possessions! This five-star rated product doubles up as a scratching post and a place for your cat to rest and unwind. It is fully reversible, so your cat can get double the usage before it is necessary for a replacement. The construction is also durable and non-toxic cardboard, so it is designed to stand the test of time. The curved shape makes scratching easier and encourages your feline friend to rest. There is plenty of space, so if you have a bigger cat or multiple pets, it is the ideal option. No assembly is required, so you can put it up and your cat can start using it straight away with no fuss. This product has a two-in-one function; it is made for both scratching and playtime. There is a small ball which is designed to roll around the track, so your cat can bat it around as much as they please. 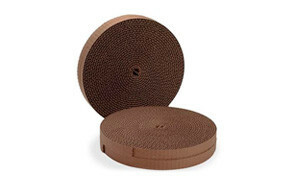 At the center is a textured scratching pad which is replaceable when it wears out. Ultimately, this helps to stop your furniture from getting torn to pieces while also giving your cat the mental stimulation which they so require on a day to day basis. Many cat owners have rated this product very positively indeed. Many cats have a natural urge to climb up to higher ground, and this activity tree allows them to satisfy this need, while also giving them plenty of places to scratch. Once they reach the top, there is a round platform with raised sides which acts as a bed. The square base is ideal for positioning in the corner of your room, so it won’t take up too much space in your house, and it also makes it less likely that it is going to tip over. As for the assembly, it is simple enough to screw together and all the instructions that you require are included. If your cat likes catnip, this is a good way of luring them towards using the scratching boards. 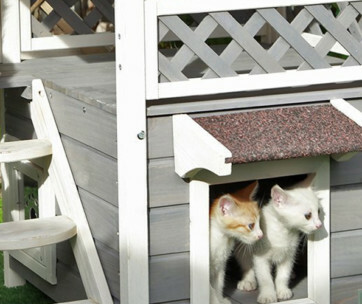 The surface is corrugated and rough, giving your cat a place that they will love to scratch. While some scratching posts can be extremely bulky and space-consuming, this one lies close to the ground and is less noticeable. Just like all scratching products, it gives your feline friend a place where they can sharpen up their claws and stretch their body. This large cat scratching post takes care of two of your cat’s needs. It is both where they can work off their natural scratching urge and a lounge where they can relax and unwind. 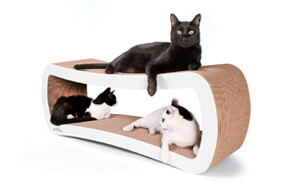 Ideal for multi-cat households, as many as four felines can use it for rest and play. The dense cardboard construction is designed to last a lot longer than other similar products. You can rest assured that it is an eco-friendly product made from recyclable corrugated cardboard and non-toxic corn starch glue. If you are looking for a classic and simple cat scratch pole, this one ticks these boxes. The entire rounded post is wrapped in natural sisal, so your pet can use it all the way around. It is suitable for cats of all different ages and sizes. 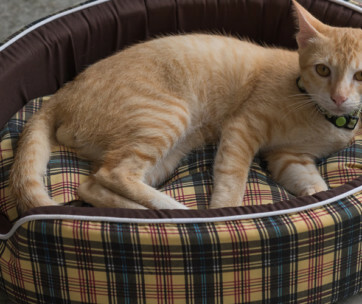 The base is soft and cozy, so your cat can unwind and have a nap after they have done with their scratching session! And if you are interested in internal design, the tones are subtle and neutral to fit in with a range of different decors. This scratching device comes in a flat design if your cat prefers this to the post style. It is nice and wide, so your pet has plenty of room to scratch to their heart’s content. There is also some catnip included if your feline needs a bit of extra encouragement to use it. Plus, this is a very affordable option which is ideal if you are on a tight budget. Next on the list, we have another scratcher accessory, which is designed to work with the Turbo Scratcher toy which we discussed earlier. So, if you have the product but the pads are starting to wear a little thin, you can buy this two-pack of replacement pads. Also, these pads have the natural advantage of being double-sided, so all you need to do it flip it over and your feline can continue using it for double the amount of time. Add some catnip if you want to attract your cat even more! So much more than just your run-of-the-mill cat scratching tower, it is also a place for your cat to rest and play. Two balls dangle down for your feline to bat around to their heart’s content. Also, there is a sheltered condo space inside with a removable cushion if your cat would like to get forty winks. Alternatively, they can have a rest on the hammock above. And, of course, there is also the durable sisal scratching surface where they can sharpen up their claws. Featuring an ‘X’ design which we have not discussed so far, this cat scratching post also doubles up as a hammock where your feline friend can have a catnap. The corrugated design is made to offer plenty of support to your pet whether they are lying down or scratching at their post. There is also a pouch of catnip included in case you need some extra help enticing your cat to use it. And you can simply fold the hammock away when it is not being used. This cat scratching tower has several features which are worth highlighting in more detail. As well as the post itself, there is also a ball which dangles off the side for them to bat around. The fiber is both tough and biodegradable. There is also a plush playing surface at the bottom with jingle balls for them to hunt. And when you need to clean it, you can do so using some mild soap or diluted detergent. The triangle-shape of this cat scratching device allows you to rotate it when one side is wearing out for three times the use. The vertical design allows your favorite feline to really stretch out, while they can also enjoy hiding inside. The construction is durable, made from dense cardboard to help it last for years to come. Climbing is encouraged on this tower thanks to the bird which dangles enticingly from the top. 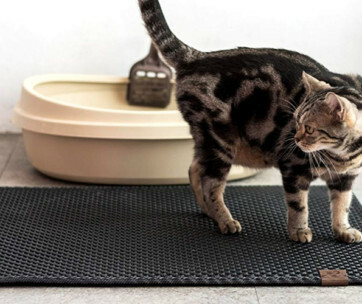 The surface is designed to be satisfying for your feline to get their claws stuck into. When your cat is done using it, you can clean it by vacuum or simple manual hand-washing. Finally, we have this highly-rated lounger, which also doubles up as a cat scratcher. The honeycomb construction makes it satisfying for your cat to scratch. The materials are 100% recyclable, so you can rest assured that you are buying an environmentally-friendly product. Now you have seen 15 of the best scratching posts available, you still may feel that you are not ready to make up your mind just yet. Don’t worry; we have a ticklist of some of the main things to consider before making a purchase such as this one. The material of any product is always worth considering before making a purchase, and it is especially important with a cat scratching post. After all, it needs to attract your cat and be rough enough to fulfil all their scratching needs. Many of the best products are made from sisal rope, which is rough and designed to catch your cat’s claws, so they can pull down to get the effects that they desire. It is also tough and durable, which means that it is more likely to stand the test of time. Be wary of carpeted materials as your cat may struggle to understand why they can scratch the post, but they can’t go near your other carpeted areas of the house. Also, it does not always provide a particularly satisfying scratching experience. Also, it is worth considering what the post itself is made from. Many are made from cardboard, but it is worth knowing more about the actual gluing and construction process. Hollow cardboard tubes tend to be quite sturdy, which is an important feature for your cat’s enjoyment and their safety. Look for a double-thick base which helps to ensure the stability of the post. Also, hollow tubes have the advantage of making a highly satisfying noise when they are scratched – something which cats are naturally drawn to. Another concern you have may regard whether the product has been made in an environmentally friendly way, so double check for more information that the manufacturer may provide. Some scratching posts just fit onto the floor, whereas others stretch up to multi-layered heights. Many cats like to stretch out while they are scratching, so you should use the rule of thumb that the post needs to be twice the height as your pet, giving them the maximum opportunity to stretch out their limbs. Cats often use these posts for scratching purposes as well as sharpening up their claws. If your cat has to bend down, this may end up being uncomfortable for them, and they will not experience the full benefits of a product such as this one. So, of you have a kitten or smaller cat, you are likely to want a smaller post. Some of the multi-layered options may be tough for them to climb up on. Cats usually like to let themselves go when they are scratching, so they require a post which is going to give them the freedom to do this. A wide and heavy base is something which is worth looking out for. If the post wobbles, it is unlikely that your cat will want to use it, and they will probably go back to your couch or other furniture items, which offer a lot more stability. This longing for a secure place to stretch explains why so many outdoor pets like to use trees as their scratching posts. Also, if the post is wobbly, it is more likely to be unsafe as it could end up falling on your feline friend. As you can imagine, this is a major problem if the post is especially heavy as it could result in injury. And if this happens, it is unlikely that your pet will want to keep returning to it time after time. Remember that the taller the post, the stronger the base needs to be. A top-heavy post is something which you should be very wary of. As you will have been able to tell from the above list, there are several different types of scratching product out there. There are both vertical and horizontal products out there. You may well be questioning which one is best. Well, the truth is that cats like to stretch in both directions. You could either look for a scratching product which serves both purposes or consider the option of getting one of each. Consider choosing a different type of material for each to give your cat the best of both worlds. Next up, you have the cat perches or condos which also offer a place for your cat to sleep. There are plenty of different options in this product area, but you should look for one which has a sturdy, sisal-coated post that will satisfy their scratching urges. You also have the angled cardboard cat scratchers. These work out different muscles which would otherwise be left dormant. This provides satisfaction for your cat and has obvious health benefits to them as well. Many cat posts also double up to serve other purposes as well. For example, you have the posts which are multi-layered and have places to sleep either on top or a cozy little enclave. Some also act as toys. There may be balls dangling down or things to bat around between their scratching sessions. You also have the ones made from corrugated cardboard, which offer a couple of places for your cat to relax and may even be suitable for multiple pets if they are big enough. Also, it provides a place that your cat can get territorial about. After all, everyone needs something or somewhere that they can call their very own! If you buy a scratching product which serves multiple functions, it stops you from needing to get each one of these things individually. Of course, you should always consider how much space you have available in your house to get a better idea of whether it is going to fit or not. Since your cat scratching posts is going to form an important part of your home, you will want it to fit in with the style of your abode. At the very least, you don’t want it to look unpleasantly unattractive! Also, you may have certain space constraints in your home which you need to be wary of. As there are so many different styles out there, you are bound to find one which fits your home perfectly, as well as doing the job it was designed for. Alternatively, you may have more than one cat who needs a place where they can happily scratch away to their heart’s content. 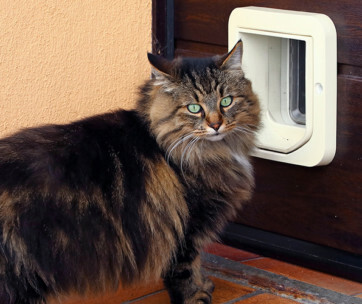 A cat scratching pad or post is one of those essential cat products which serves a whole host of purposes and also have plenty of advantages too. So, let’s talk in a little more specific detail about what some of these are. First and foremost, scratching on a regular basis is good for your cat’s claw health as it helps to shed loose layers from them. This is an important part of keeping them in the best condition, which is sharp and ready for action when needed! Another natural benefit which your feline friend can get from a good scratching post is the opportunity to stretch out their whole body. This is an activity which your cat needs to engage in on a regular basis to ensure that their muscles stay in the best condition. Cats are very active creatures and like to be ready to spring into action whenever they like! You are bound to already know that all cats badly need exercise, but you may not have thought of scratching as being one way that they can get this physical activity. Posts made from a thick, robed fiber are especially beneficial as they really have to make an effort to dig their claws in and withdraw them once again. Also, they are often standing on their hind legs and stretching at the same time. Some of the taller towers also involve climbing too. Kitten scratching posts can be especially beneficial to young felines who have a lot of built-up energy that they need to release. Also, if you can get your young cat used to one early in their life, this is something that they can carry with them for many years to come. Just like you, your feline friend can suffer from stress. One way of relieving this is by scratching a sisal scratching post as this provides a satisfying experience for them. Also, the stretching and exercise which we have already mentioned can also contribute to better emotional health. All cats have a natural desire to scratch, and if they aren’t able to do so, it is likely that they are going to want to expend this excess energy somewhere else. A prime candidate is your furniture! And if you have spent a lot of money assembling your living room, the last thing that you want is it for it to be torn to shreds! Once you direct your cat to their scratching post and they get used to using it, you can avert this problem. After all, it provides a much more desirable place for them to sharpen up their claws as it has the kind of rough surface which they so badly desire. And if you are sick of getting a hole in yet another jumper after your cat has gotten their claws stuck in, a scratching tower is certainly going to be a worthwhile investment for you! The drapes are another common place which they often choose. If you live in a household with multiple pets, the ways in which they interact together can be varied from the politely cordial to the extremely hostile! A scratching post provides a place where they can all convene, as well as encouraging them to play and interact together. Since all cats love scratching, this is the kind of place which should naturally draw them all in! Q: What is a cat scratching post? A: Cat scratching posts usually consist of a wooden or cardboard post coated in a rough material which your feline can sharpen their claws on. Also, you have other scratching products such as pads which are placed on the floor. As we have already mentioned, cats have a natural instinct to scratch, and a post provides them with a place to do so. If they are left to their own devices, they will often choose somewhere less acceptable in your home such as a treasured item of furniture! Q: Why does my cat scratch? A: Cats scratch for a variety of different reasons. First, they like a place where they can leave behind their scent and visual markings. Also, they like to sharpen up their claws on a regular basis. On top of this, scratching also provides them with an opportunity to stretch out their limbs and muscles. Q: How do I teach my cat to scratch on a scratching tower? A: First up, you need to make sure that you select a tower which is both tall and sturdy enough for your kitty, so it is not going to topple over when they are getting into their scratching groove. Next, you need to position it in the right place. Rather than tucking it away in the corner of a room, it should be somewhere clear and obvious. If you can choose an area where they normally like to go to sleep, this is even better. Once your cat has become used to the post, it is likely that you will be able to move it elsewhere if you would like. Alternatively, if there is a bit of carpet which your cat always seems drawn to, you could replace this with a scratching pad. If your cat isn’t immediately drawn to the post, there are a few techniques that you can use. Some cats go crazy for catnip, and if you have one of these felines, you could sprinkle some atop the tower to make its presence even more obvious. You could also try playing with your cat around the scratching tower, helping them to associate it with positive things. A wand toy is useful as you can direct your cat to get their claws stuck into the tower. Or try putting their favorite toy on top to encourage them to climb up. Another option is to use treats to drum up interest in the scratching post. Positive reinforcement of good habits tends to be the most effective way of training a cat. As you will already be well aware, cats are fiercely independent creatures, so trying to force their paws onto the tower is unlikely to go down too well with them. However, you may need to supervise your cat closely to stop them getting back into their bad habits of tearing up your furniture or carpet. Q: Does nail trimming stop a cat from scratching? 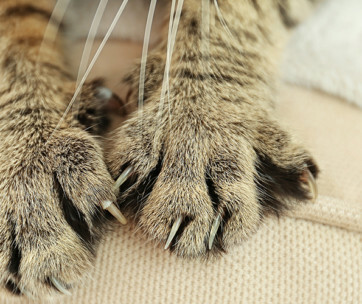 A: Trimming your cat’s claws can prove to be an effective way of stopping them from clawing at your furniture, but a scratching post can still prove to be a worthwhile investment. If you do trim your cat’s nails, this makes them less destructive when they start scratching. Of all the scratching towers on our list, we have chosen this one as our favorite. The post is durable and made from fibrous, durable sisal, which naturally encourages scratching. It is tall enough for your cat to stretch out as much as they like. The sturdy base increases safety and makes it less likely that it will topple over.